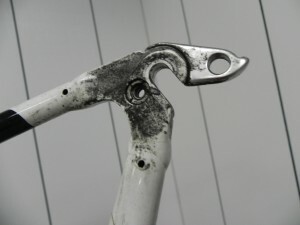 There is plenty of information around on cleaning your bike and products to assist you in doing this. Many of these products are aimed at removing heavy, congealed dirt on chains and the frame. In my opinion, if you are in the position of having to use these sorts of detergents, it is too late. Anyhow, soap and hot water is fine, used after every ride preferably. Bicycle maintenance is an ongoing project if not from the safety viewpoint, then from the viewpoint of getting the most out of your investment. Expensive sporting equipment that’s well made can endure a lot. But there is a limit. It’s also about being prepared and remembering that prevention is way better than cure. A good reminder of the extreme difficulties that can come from not being completely on top of the preparedness aspect is Jill’s recent post at Jill Outside. It really conveys the ease with which trouble can overwhelm you when you are just not expecting it and have been even a little unfocused in covering all the bases in your preparation for “what if”. Getting to the point, I received a frame from one of my dealers a day ago. 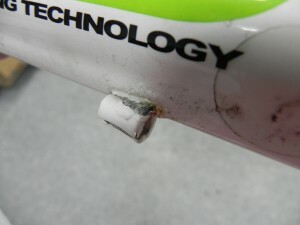 A customer had brought his bike back complaining that the frame had “cracked” along the Bottom Bracket. This would be a first, if it turned out to be true. 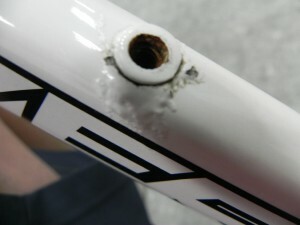 When I received the frame, I was shocked to see the state of repair it was in. In the 18 months since it had been assembled, it had probably not ever been cleaned. My workshop mechanic had to do quite a bit of cleaning on the Bottom Bracket shell to better be able to see whether or not the mark we could see was, in fact, a crack. . . This has been cleaned up considerably compared to how it was, leaving a better view of the nature of the damage. A crack it is not. More likely something has got wrapped around the BB shell and “bitten” into it, creating a depression, or something else happened that we are not aware of. That was my advice to the dealer. 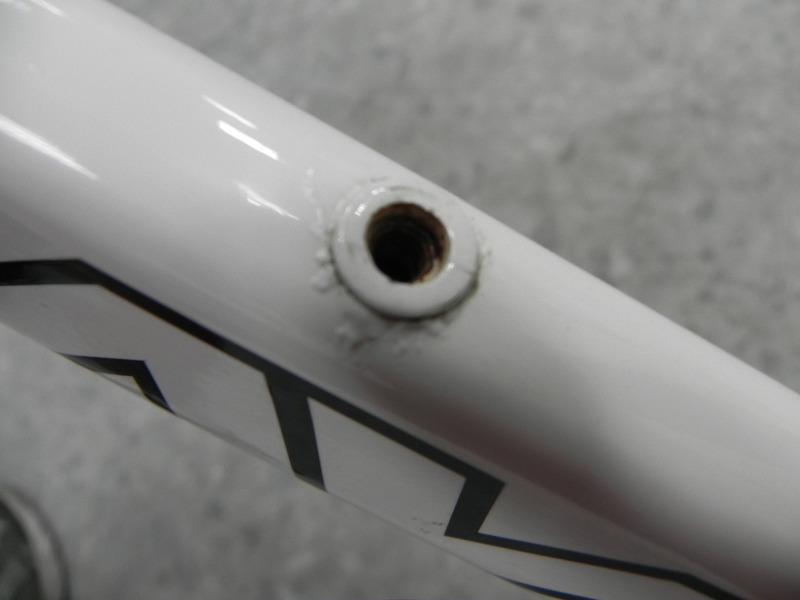 But what is really of concern here, and went unremarked upon by either the cyclist or the dealer, is the filthy state of the frame. 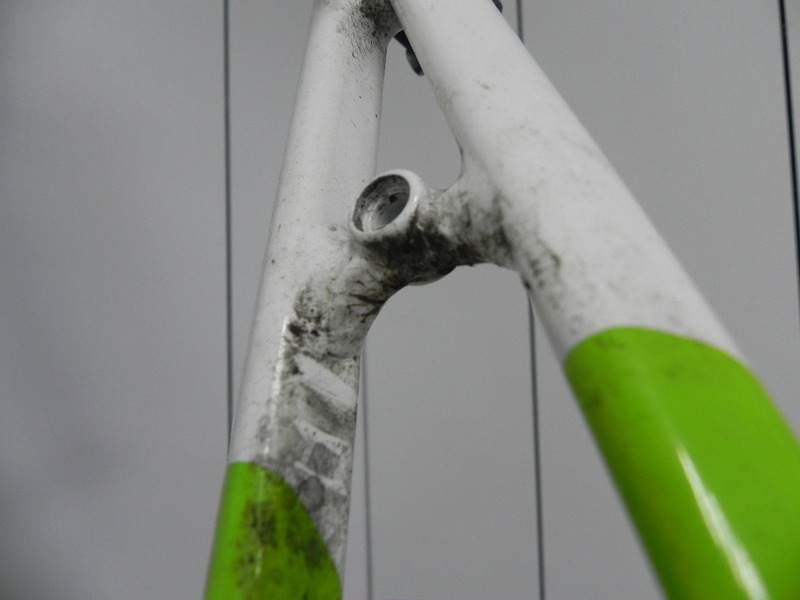 The frame has been extensively cleaned by the time of these photos, but this one of the rear dropout gives you an idea of the level of dirt that had accumulated. 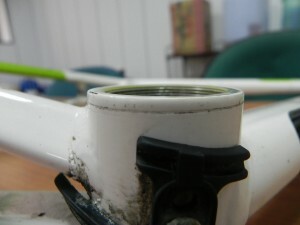 The alloy is deteriorating and the paint is lifting. Before this was cleaned away, it was just a black morass, and no damage was visible at all. The other one is beginning to go the same way. There is corrosive damage also creeping in around the rear brake boss. It is really disappointing to see a frame descend into such a state. It could all be avoided with a 10-15 min cleanup fairly soon after a ride, even though after a tough day this is the last thing you feel like doing. While we are on the subject, equally important is a quick bit of TLC for your chain: spray some frame cleaning fluid on a rag, wipe off excess muck from chain (rotate crank several times exerting light pressure on the chain). Then a quick dab of good quality oil on each rivet followed by a wipe down similar to the initial clean to remove excess. Revel in the beauty of a clean bike and the admiring, even envious, glances of fellow cyclists, coupled with the gentle buzz of lightly lubricated links humming though the derailleur [non-cyclists may never fully relate to this 🙂 ]. Add an open road, and it doesn’t get better than that.